Obviously the title makes it very clear to you what I want to write further. It is never known which work Shirdi Sai Baba entrusts to whom. This is very well known to us and has been narrated by Hemadpant in Sacred Sai Satcharitra. The journey of my blogs cannot be measured in years as it had been started just a few months ago. I was not aware what Shirdi Sai Baba had reserved for me but slowly the pages of the mysterious book are being opened. Being new in this field and new to devotion too, I started gathering every possible resource through which I could spread the nectar of Sai Love in every direction. All this happened only due to Grace of Shirdi Sai Baba. Running back into memories each small moment dedicated for the blog work has proved a big leap to me. The person (i dont know whether he will like his name taken publically or not, so will refer him as "Sai Man") who guided me through this journey, was sent by Baba only. Again it seems strange to think that how could a person could guide for a work who was in the same field selflessly!!! Indeed it was Baba's wish for accomplishing His Own work. I welcomed readers to share their own experiences, send prayers to Shirdi, Udi Seva, oh what a combination of Sai Seva through only one medium!!! 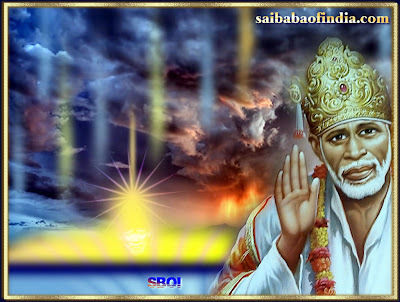 Also bhajans blog was created to spread Sai Love through melodious voices. With the word melodious voice I am reminded of a melodious voice of Sai Devotee Rana Gill. He has sung beautiful bhajans for Baba. The album name is SAI TERE HAZAARON NAAM and Mr. Gill has distributed cds of the album free of cost. Furhter more, his coming in my life was rather the most unexpected and unplanned incident. Baba wanted me to help him for his album. His bhajans were released first time on my blog. It was not over still. We started a blog for his supporting his album. I am only responsible for the blog work which gives me immense pleasure. From the very beginning I loved to listen Sai Bhajans and after I came to know him, I listen to him the most. Baba has made him do excellent work and hope you all will also download it. I have placed direct download links of the album on left side of the blog for the ease of readers and visitors of this blog. I am sure you will feel the divine presence of Shirdi Sai Baba after listening to the bhajans from the album SAI TERE HAZAARON NAAM.